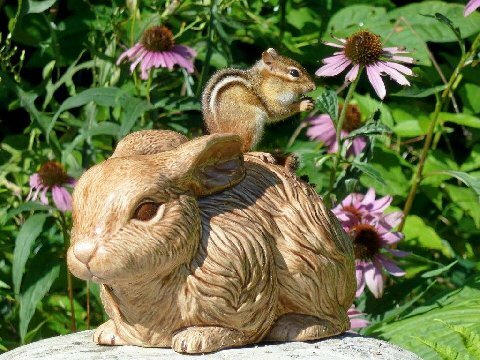 "Well there is never a shortage of animals up in the Adirondacks and this little guy has become almost like a pet....I named him "Peanuts" and he comes when I call him, eats out of my hand and sits waiting for me to come home on this ceramic rabbit in my driveway"
Gotta love the 'Dacks. Thank you Nancy for sharing. Got photos? Send them to us here.